Wyatt Anians (‘19) hosts the Royal Drag Ball. 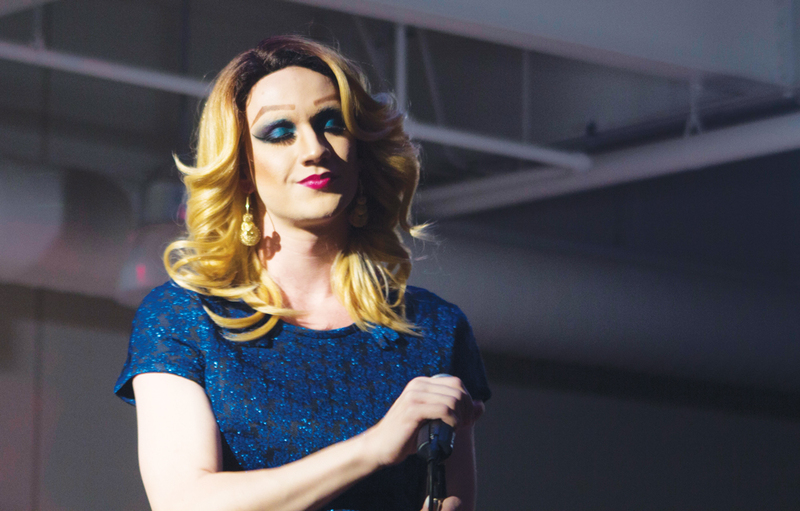 Amidst cheering and blaring music, PRIDE (People for Rights and Inclusion of Diversity and Expression) in partner with Alpha Beta Psi sorority hosted the Luther College Royal Drag Ball on April 22 in the Center for the Arts (CFA)atrium. Physical tickets sold out, so exact numbers for the event are unknown, but it is estimated that over 250 people attended. PRIDE debated charging for the event because their main goal was not fundraising, but rather to gain visibility for PRIDE and LGBTQ rights. Wyatt Anians (‘19) hosted the show in a sparkly blue dress and blonde wig as the queen Donna D. Anians and was thrilled with how the event gained exposure for PRIDE. Filiberto Lopez-Garcia (‘19), who helped extensively in the production of the show, echoed Anians’ sentiments. “Our goal for PRIDE was to create a sense of community, to bring back the drag show,” Lopez-Garcia said. The drag show was an event previously hosted at Luther but ended ten years ago due to unknown controversies. Now, the drag show is back and caused a lot of excitement on campus. The success of the drag show will help fuel other aspects of PRIDE, notably their annual trip to the Midwest Bisexual, Lesbian, Gay, Transgender, and Ally College Conference (MBLGTACC). The conference provides education on a wide array of topics and PRIDE works every year to have as many students as is financially feasible to attend the event. Ashli [Noah Manke (‘20)] and Broc [Anne Wilson (‘20)] perform a song from Rocky Horror Picture Show together. In addition to the funds, the exposure the drag show created brings the hope of fostering dialogue on important LGBTQ rights on campus. Technical Director of the Drag Show and PRIDE president Ashleigh Bunkofske (‘18) expressed excitement over the gender-neutral multi-stall bathrooms present at the show as a start to discussing heteronormativity. PRIDE is looking forward to carrying the momentum and excitement generated by this event into next year. They hope to make the drag show an annual event, a title given to an event after five consecutive years. This will help the group make a statement about PRIDE’s continual commitment to creating a positive and accepting Luther community. Lopez-Garcia said that attendees were thrilled by the performances and the prospect of getting involved themselves, as the drag show presents a chance to experiment with an expressive art. The show was successful in part because it presented opportunities for changes and growth, according to Bunkofske and Lopez-Garcia. They spoke of changing the location or technical aspects to provide for the longevity of the show. The CFA atrium offered good connection between the audience members and the performers. Performers could walk, or fall, off the stage into shrieks and waving dollar bills. Lopez-Garcia expressed concern about the size of the space and will investigate a change in venue to help the show. Bunkofske is worried about finding someone who can handle all aspects of tech once she graduates. Bunkofske was responsible for sound, set-up, stage design, and volunteer coordination. Bunkofske enjoyed the work, but in hopes of making the annual title a reality, she recognizes the need for a sustainable model for tech which anyone could implement.